A great way to eat carrots is to make a delicious salad. Not just because salad is healthy or carrots are nutritious but they are tasty too! 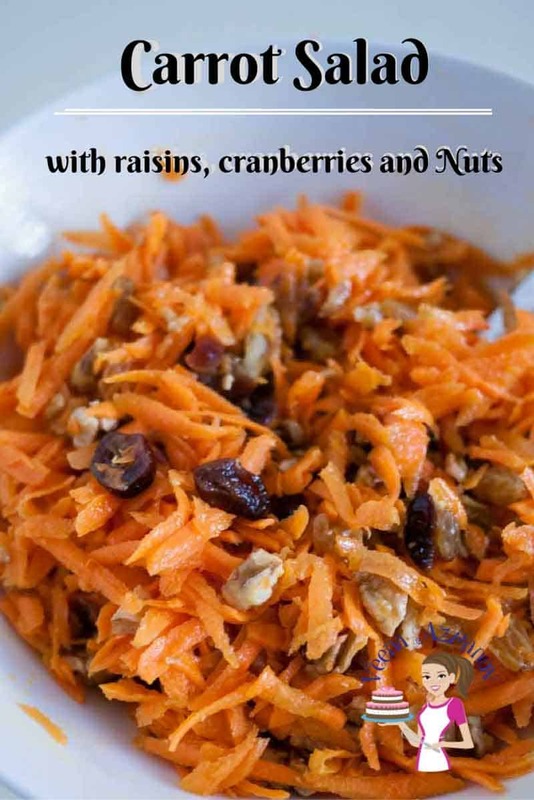 Throw in a few raisins, cranberries and pecans and what you have is a delicious Quick Carrot Salad. 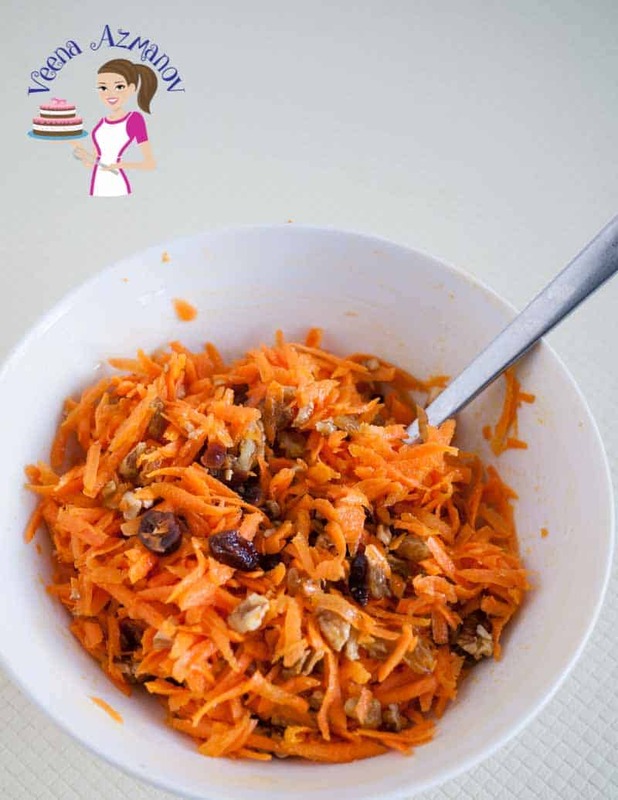 A long time ago when I visited Brussels, I really enjoyed this carrot salad with raisins and pecans at a restaurant. I like it so much I knew I had to ask the chef how he made. Some chefs are pretty cool and share these things. The answer I got was – it’s just carrots, raisins and pecans with a little seasoning and lemon juice. Nothing more..! According to him – Most people don’t make carrots because they just assume carrot is a very boring vegetable and should be added into a dish along with other ingredients. But the truth is that carrots are tastiest on their own. It’s been ages since I made this salad until recently a friend made something similar for breakfast. I knew I had to come home and make this again for the kids. They loved it. Now it’s become a family favorite. Simple, Easy and Quick! That’s how I like my salads? Now I cannot emphasize enough on how easy and simple it is to make. 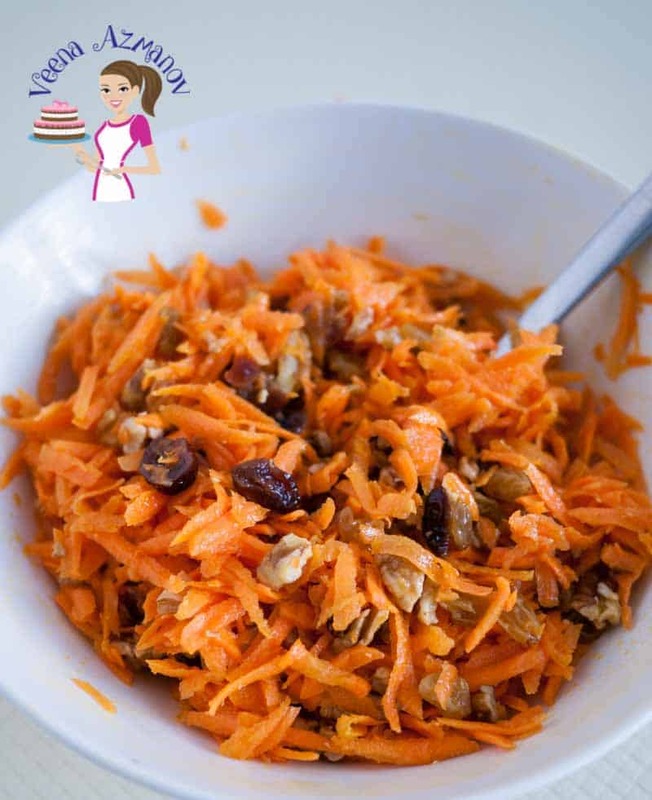 Check out the video above and you will see it really takes two minutes to grate the carrots and another minute to make the dressing. Maybe another minute to source your raisins, cranberries, and nuts. The carrots, of course, are the stars of the show so buy fresh juicy carrots. Raisins and Cranberries – this is my choice of dried fruit but go ahead and change them to something you like. Try chopping some apricots, figs or even black currants. Nuts – again I’m using Pecan today but walnuts make a great choice too. Place the raisin and cranberries in 1/2 cup water and heat in the microwave for 30 seconds. This will soften the fruit and make them soft and juicy. Drain and set aside. Chop the Pecans or Walnuts into smaller pieces. Combine the lemon juice, olive oil, sugar, salt and pepper in a small jar or little bowl. Mix well to combine. Grate Carrots using the large side of the grater. Add in the fruit and nuts, Followed by the salad dressing. This is one of my favorite ways to eat carrot. Kids love it too. Could you skip the sugar and use Stevia? Absolutely Sheri – You could skip the sugar completely!! The little amount just help bring out the carrot flavor but it’s not a must have ingredients. The cranberries are sweet too! This is such a great classic salad! So healthy and yummy! I love carrot salads. 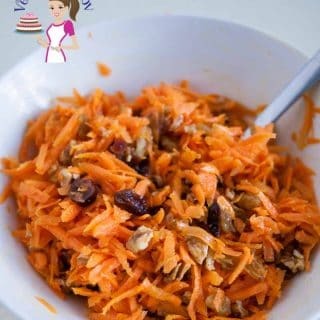 I agree that many people think of carrots as just being healthy, but they can be so versatile with a little imagination. This recipe sounds wonderful and a perfect salad to set out during the holidays! I’m all about quick easy salads and this one looks really Yummy! Great story about the chef sharing his recipe with you! Thanks Angela. yeah it was nice of him to share with me. I love carrots too!